Innovating by optimising interactions between man, machines and the environment. This principle has always been inspiring the engineers of Schneider Electric, a leading multinational company in the field of electric energy management. 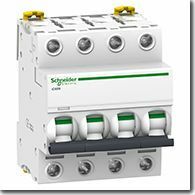 Acti 9, one of the latest Schneider products proposed in the field of modular systems for the final distribution of low voltage, was developed based on this inspiration. Acti 9 is a system made of multiple devices for the distribution and measurement of the electric current supplied to the end user, and includes protection devices, monitoring and control, metering, communication systems as well as accessories for the installation. Maximum safety is an absolute imperative when it comes to electric current, and even in the case of Acti 9, attention to ergonomics, flexibility and practicality cannot leave out the reliability of every single element of the project. Schneider Electric, already partner of LATI for the self-extinguishing compounds used in the production of boxes, supports and housings, has decided to rely on LATI even for the materials to be used in the internal parts of its devices. In particular, the self-lubricating LATILUB 87/28-10T G/20 compound has been selected for the manufacture of the rotary cam actuating the switches of Acti 9, thanks to its excellent mechanical and tribological properties. Formulated from a PC matrix, thanks to the content of PTFE, this grade offers an extremely low friction coefficient resulting in a smooth, fast, pleasant and reliable operation without jamming over time. Mechanical strength is also due to the structural reinforcement inside the compound, which in this case is made of 20% glass fibers. This is an ideal combination with the self-lubricating properties of PTFE. The amorphous matrix also ensures dimensional stability and compliance with geometric design tolerances, which is an essential requirement for an element required to perform a fundamental function under maximum safety conditions even in harsh environments due to external temperature or humidity. The range of LATILUB self-lubricating compounds combines many materials developed during the long experience of LATI, and designed to meet the most demanding mechanical, thermal and chemical resistance requirements. However, the attention of Schneider’s designers was driven by an intrinsic advantage offered by LATILUB, namely the availability of self-lubricating elements perfectly able to operate even without external greases and oils, thus not requiring expensive maintenance and preventing the application from the risk of stopping or failure due to wear or dirt build-up between moving parts.